Nine years ago I started taking antidepressants and entered a world of side effects: dizziness, fatigue and forgetfulness. Selective serotonin reuptake inhibitors (SSRI) also introduced me to a surge of anxiety that made me contemplate suicide. My doctor added a mood stabilizer to the mix, and from then on I managed, sacrificing my body for my brain. If a medication doesn’t necessarily work, you’re supposed to adjust or try something new, but I hesitated for years. Eventually I was ready to live again, so I cut my dose of Lexapro in half. Conducting experiments on my brain (more of this, less of that, switching medicinal classes), I slowly came back to life. Managing mental illness is a process, and going on medication isn’t a quick fix—almost a decade later, my mental health has improved greatly, but I still haven’t found the right balance for both my brain and my body. Nearly one in five Americans suffer from mental illness, especially young adults and teenagers. The stigma of mental illness and medication is fading. However, doctors are often too busy to discuss side effects, and in the case of behavioral meds, that can mean the difference between managing illness and contemplating suicide. Antidepressants are the third most commonly prescribed medication in the United States and currently have four classes: SSRIs, SNRIs (serotonin-norepinephrine reuptake inhibitors), NDRIs (norepinephrine-dopamine Reuptake Inhibitors) and TCAs (tricyclic antidepressants). (MAOIs, the oldest class of antidepressants, are virtually unprescribed these days.) Because anxiety and depression are both caused by a serotonin deficiency (and often exist simultaneously), antidepressants are used interchangeably for both illnesses. SSRIs work by preventing the brain from reabsorbing serotonin, a neurotransmitter that carries signals throughout brain cells. Because the serotonin isn’t being reabsorbed, SSRIs help combat serotonin deficiency, the main cause of depression. 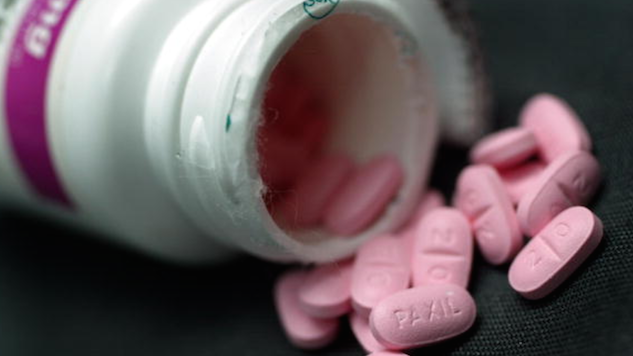 Common SSRIs include Lexapro, Paxil, Prozac and Zoloft. Drowsiness and dizziness are the most common side effects of SSRIs, and they can also increase nervousness or agitation and decrease both sexual desire and ability. From my experience, I’ve found that certain SSRIs take a harder toll on my sleep cycle; on my original dose of Lexapro, for example, I transformed from a morning person to a somnolent creature that took five-hour naps and struggled waking up in the morning—I often felt like I’d been drugged the night before. SNRIs block the reuptake of both serotonin and norepinephrine, a neurotransmitter that is released all over the body in response to stress. The FDA approves Cymbalta, Pristiq, Fetzima and Effexor XR to treat depression and anxiety as well as chronic pain and panic disorder. Along with dizziness and fatigue, SNRIs are known to cause extreme sweating and thirst, constipation and loss of appetite. NDRIs prevent the reuptake of norepinephrine and dopamine, balancing out negativity, increasing focus and giving users a “boost.” Popular examples of NDRIs include medications like Focalin, Wellbutrin and stimulants like Concerta and Ritalin. NDRIs are like the Adderall of antidepressants and are often prescribed to patients who need a less addictive energy boost. That being said, getting on an NDRI can cause increased anxiety and manic energy streaks—if the medicine is working properly, then those side effects will go away within a few weeks. Tricyclic antidepressants have been used to treat mental illnesses including depression, anxiety, bipolar disorder and obsessive-compulsive disorder as well as chronic pain and migraines for decades. Like SNRIs, TCAs prevent the reuptake of serotonin and norepinephrine, but do so by targeting the involved transmitters. Popular TCAs include Asendin, Nonpramin, Sinequan and Anafranil. Blurred vision, low blood pressure, rash and increased heart rate are among the side effects associated with TCAs. The best source for comprehensive information on any drug is the package insert (aka “patient information”) that comes with your prescription. Here, you’ll find information that’s directed at both patients and physicians. Before switching a medication, you may want to talk to your doctor about adjusting the dosage. Too much of an antidepressant can exacerbate side effects, while too little might not fix the problem. It’s important to talk to your doctor about any medicinal adjustment, and quitting an antidepressant cold turkey can be fatal. Unless you’re seeing a complete idiot, your doctor won’t prescribe an antidepressant that conflicts with other medication—other behavioral meds, birth control, etc. That said, your medication will likely conflict with other substances, especially alcohol and drugs. Your doctor might caution you to limit your intake, especially in the beginning. Sarra Sedghi is Paste’s assistant food editor. In her spare time, she’s an antidepressant sensei.